These sessions offer a contemplative embodied prayer experience that integrates movement, meditation and prayer. In these classes, participants are invited to breathe, listen to scripture or a reading and open to invitation. 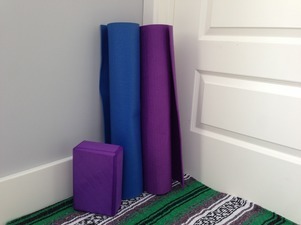 As an invitation arises, participants engage in movement and meditation through yoga poses. These are simple and basic poses; no yoga experience is necessary. Sessions are offered in Advent and Lent and are facilitated by Melissa Schroeder. Each year during Holy Week, we offer Stations of the Cross. In times of old, people would make pilgrimages to Jerusalem to walk and pray in the places Jesus lived the last days of his life. As Christianity spread and distance made this difficult, the prayer practice of Stations of the Cross developed. Instead of physically journeying to Jerusalem, stations were set up in local churches with artwork and sculptures depicting scenes of Jesus’ journey to the cross. 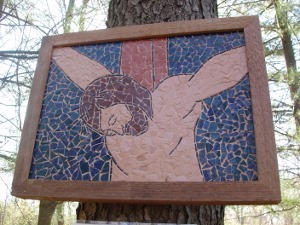 Our version of the walk includes 14 colorful mosaic stations with scripture and meditation depicting Jesus’ final hours. This walk is outside through the woods and appeals to all ages. On Easter Sunday through the 50 days of Easter, seven Stations of the Resurrection mark the risen Christ’s appearances from dawn of the first Easter through ascension. These Stations are encountered in a walk through the woods. 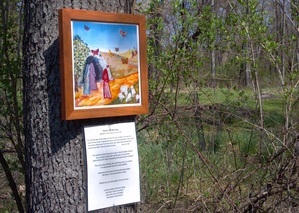 Enamel watercolor plaques, scripture and reflective questions provide opportunities for prayerful meditation.